People have been building gates for a very long time, using materials that range from prehistoric lumber to ultramodern polymers. Here’s a concise rundown on some of the more popular options, and what makes them so appealing. These types of systems tend to be of medium weight, and most wooden gate designs can provide a good deal of privacy. The classic wooden ranch style gate is also ideal for keeping wildlife out and domestic animals in. The downside is that these systems require a fresh layer of paint every year or so, depending on the local climate. The main downsides of this material are that it can rot or warp if not maintained properly. Sturdier types of wood tend to be heavier and more expensive. Aluminum is one of the most lightweight options out there, which means it can be used for sliding, swinging, or lifting gates, and puts less wear and tear on the opener than a heavier material would. It's also heavily resistant to rust. The downside is that aluminum dents and breaks rather easily, which makes it a poorer choice if security is a major concern. Metal gates come in a great variety. Wrought iron gates are strong, and can make a real aesthetic statement, but they’re also much heavier than wood or aluminum, and require frequent maintenance to prevent rust. 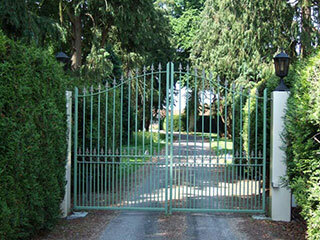 Steel gates are probably the strongest on the market, and are more rust-resistant than iron. However, they’re also very heavy, which limits the design options and makes you require a more powerful electric opener. The most recent popular additions to the list of gate materials commonly used today are plastic polymers like PVC. In most regards, these synthetic systems are similar to wooden ones, except that they require less maintenance and are made from recyclable materials. The main drawback to a PVC gate is the higher cost when compared to most metal and some wooden options. There’s plenty of other factors to take into consideration when thinking about what kind of new driveway gate you should get. Our experts at Roll Up Door Repair Manhattan will happily provide you with some professional input. Call us for more information. An automatic gate system is an excellent way to add security and curb appeal to any property, whether residential or a commercial business. But unfortunately, this type of mechanism can incur some trouble every so often, and what that happens you'll need a professional to come and take a look and apply the necessary repairs. That's what our team is here for. Take a look at the rest of our website to learn more about our services and projects. Our technician will contact you before arriving. Until then, feel free to browse our website! Roll Up Door Repair Manhattan is at your service!